The yarn is TLC Amore by Red Heart. It’s a blend of 80% acrylic and 20% nylon. The color is Garnet. When I bought this particular yarn several years ago, it was on sale and I really liked the color. There were five skeins left in the bin, so I purchased all five. 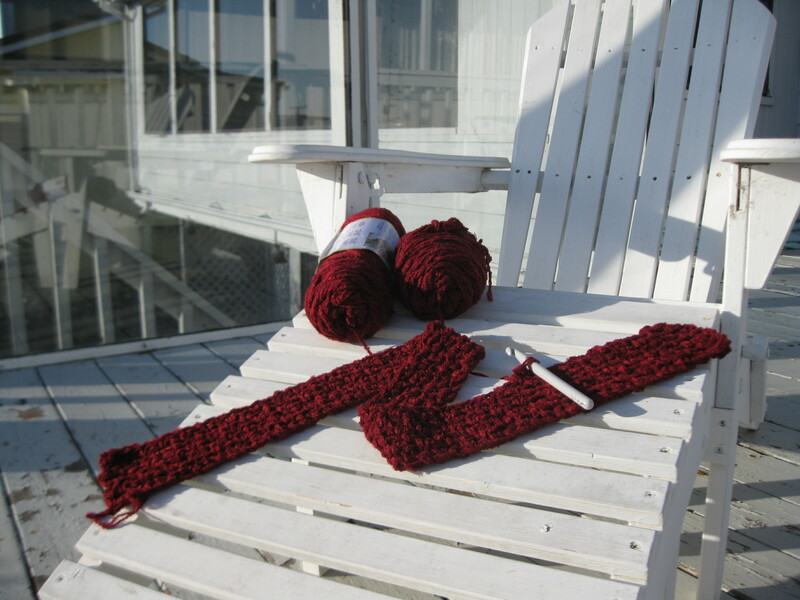 At the time, I thought I would use the yarn to make a crocheted sweater, poncho, or wrap– something that I could wear, because the color was so pretty. 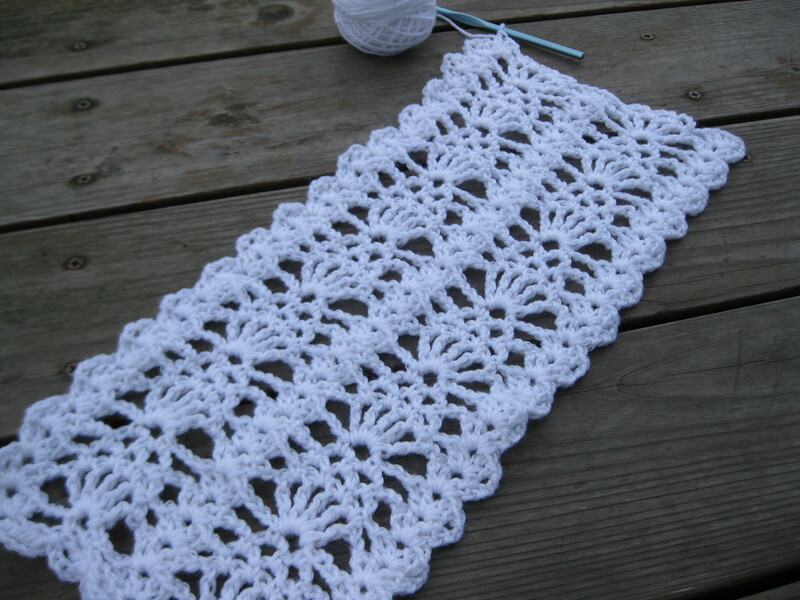 Then I got it home and tried to crochet a base chain just to start a gauge swatch, and I got frustrated. The color and texture of the yarn made it hard to see where I needed to insert the hook to crochet my stitches. I set the yarn aside and didn’t go back to it again until last week. This time, I did some experimenting with different sizes of hooks and came up with the idea to double the yarn and use a jumbo hook. I played around with different stitch patterns and settled on the basic seed stitch, which I’ve also seen referred to as the moss stitch. I’m almost done with the first two skeins and will have to add two more skeins soon. It’s shaping up to be a decent size, at least bigger than a baby blanket, and it’s very soft, so I think it will turn out to be a pretty nice afghan. This one I might keep. Maybe. 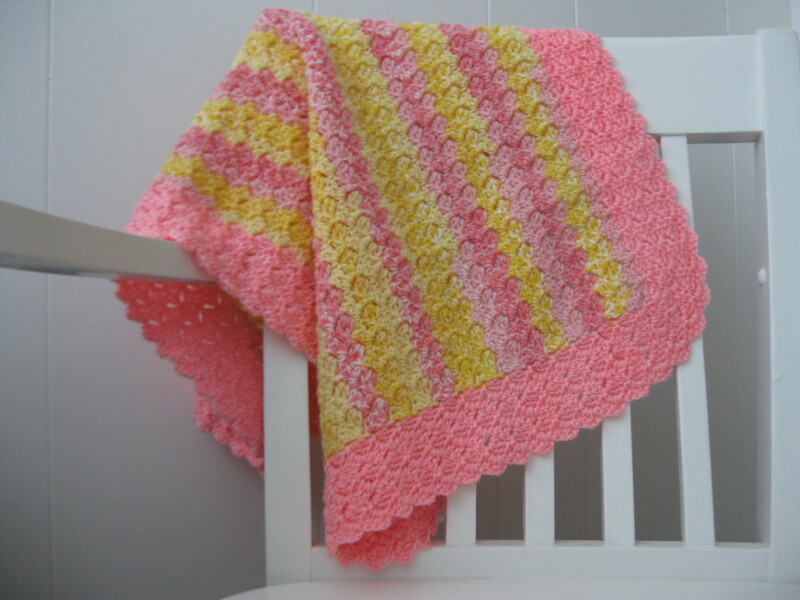 Categories: Handmade | Tags: afghan, crochet, stash busting | Permalink. The luchadors measure three inches tall, which should give you an idea of how much of this yarn I have left. Hanging out happily on a large crocheted granny square. I also want to point out that the new addition to the family came with an outie bellybutton. Categories: Adventures with Sean, Handmade | Tags: afghan, crochet, luchador, Sean, stash busting | Permalink. 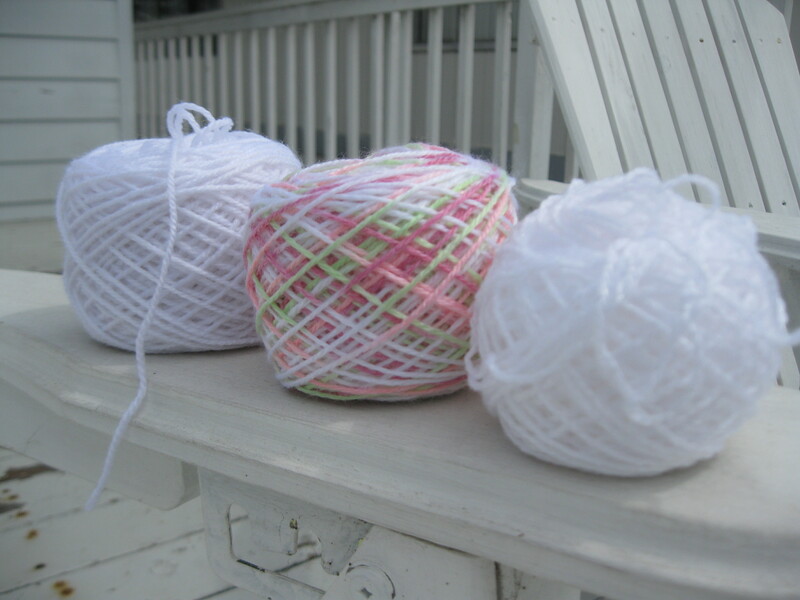 So I looked at all the yarn in the stash and pulled out these three little orphan balls that looked like they could go together, somewhat. Naturally they didn’t have their labels anymore (why? why didn’t I save the labels and stick them in the middle of the ball, like thinking people do? ), but it was pretty clear that they were three different brands and dye lots. I figured they had the potential to be transformed into something cute. I started with the multi-colored pastel ball and crocheted a few row of shells. 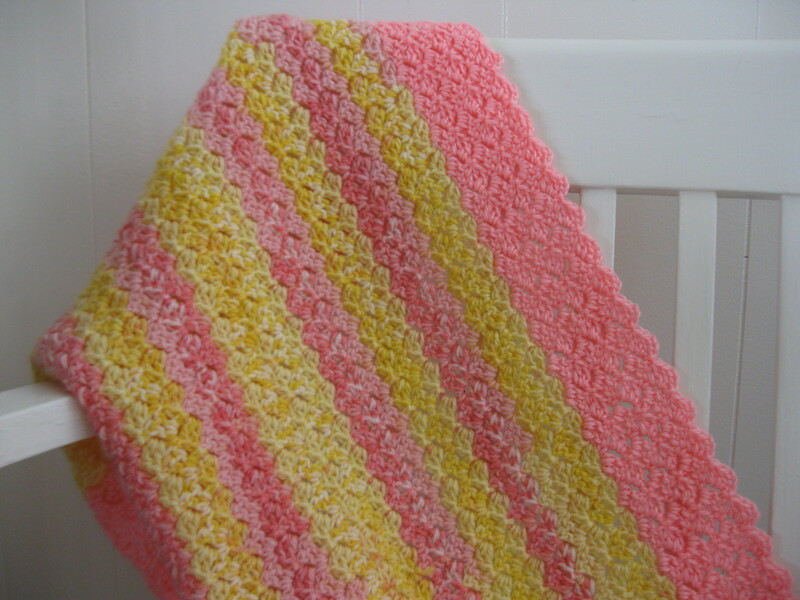 Then it became pretty clear to me that I would end up with another small rectangle, like my most recent pink and yellow baby blankie. I decided I wanted to make something different this time, where I would start the piece at the center and work my way out. 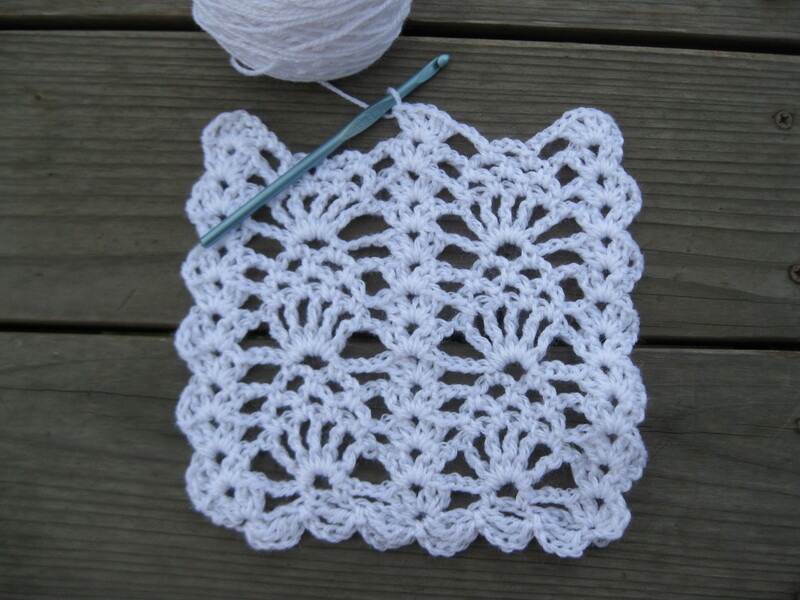 I could either crochet essentially what would be a round lace doily or a large granny square. I went with the granny square. 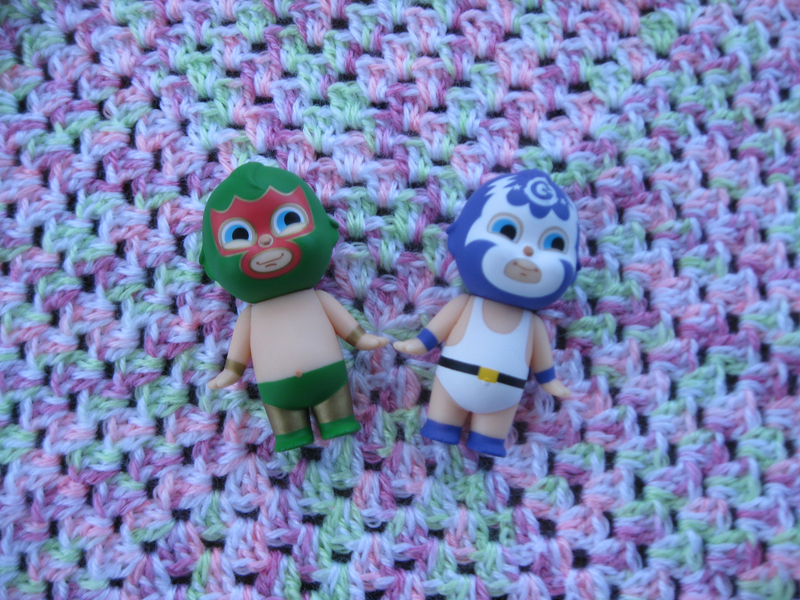 Here is my little Luchador mascot, who you will recognize from my blog header. We’re both trying to decide if we like how this granny square project is turning out. 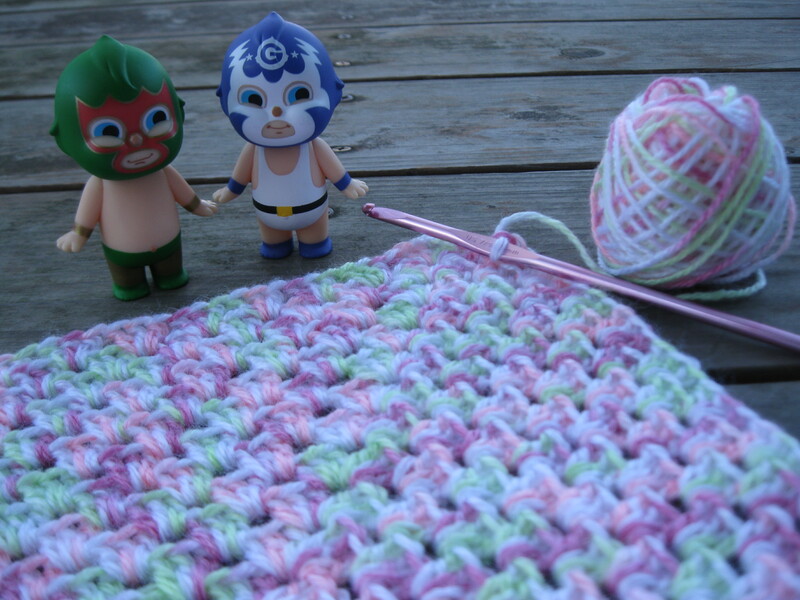 Categories: Handmade | Tags: afghan, crochet, lucha libre, luchador, stash busting, yarn stash | Permalink. As you know, lately I’ve been on a stash-busting kick and working on crocheted blankets to give away. Truthfully, it’s because I got bored with knitting, and crochet gives me the satisfaction of finishing a project in just a few days. You’ll notice that I’ve been sticking to flat pieces and not things like hats or baby sweaters, which would be just as useful and good to give away to charity. It’s because I’m being lazy and I don’t want to think about increases and decreases and shaping and counting stitches. 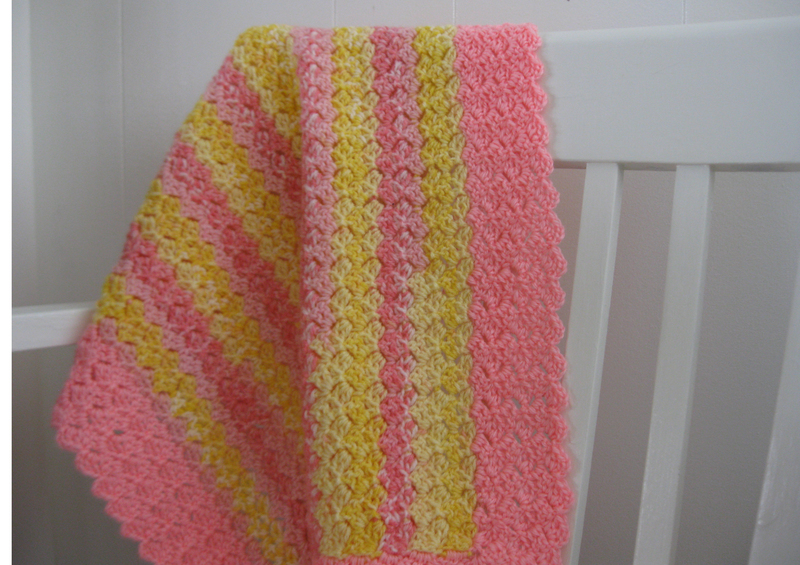 For this particular little afghan, I used two orphan balls of sport weight yarn from the stash. They were made by two different companies, but were similar in color, weight, and fiber content (100% acrylic). I’d thrown away their labels a long time ago, which is actually a good thing, because the perfectionist part of me knew that I wouldn’t have enough yarn to make an adult-sized afghan and I was tempted to go on eBay and find more skeins– which would have defeated the original purpose of using up yarn from the stash. So I gave myself a little talk and made my peace with the fact that the finished blanket would be a small one– 17.5″ by 27″, to be precise. Yup, there it is in all its entirety. About the size of a baby doll blankie. I had fun making this little afghan. 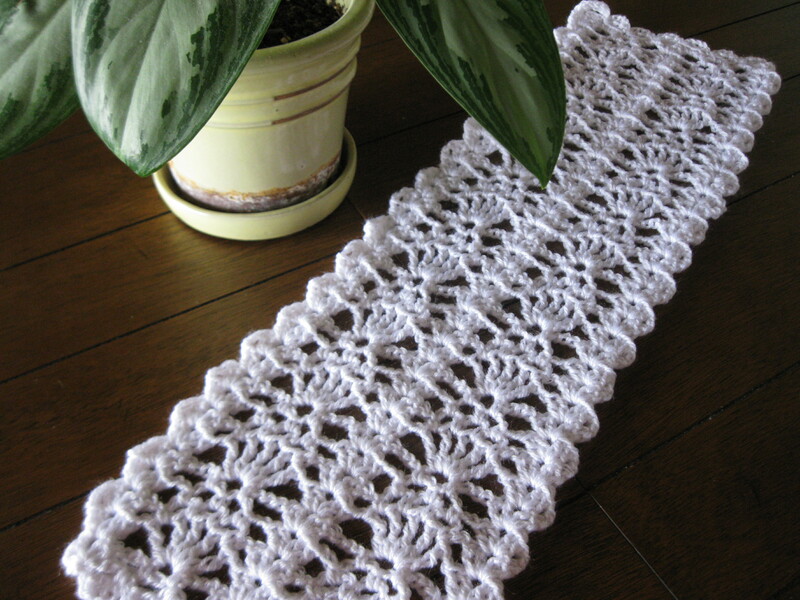 The pattern was a repeating shell stitch that I found in one of my crochet books. 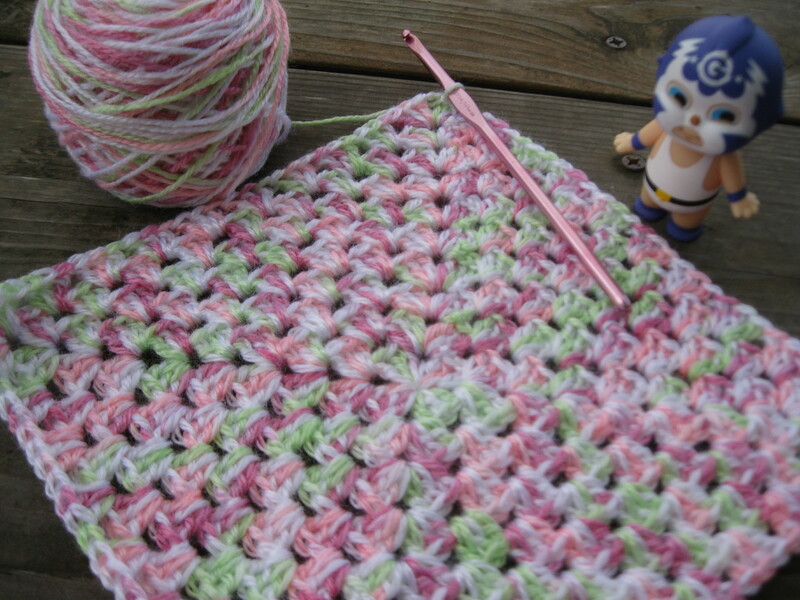 I’m very into the shell stitch right now. 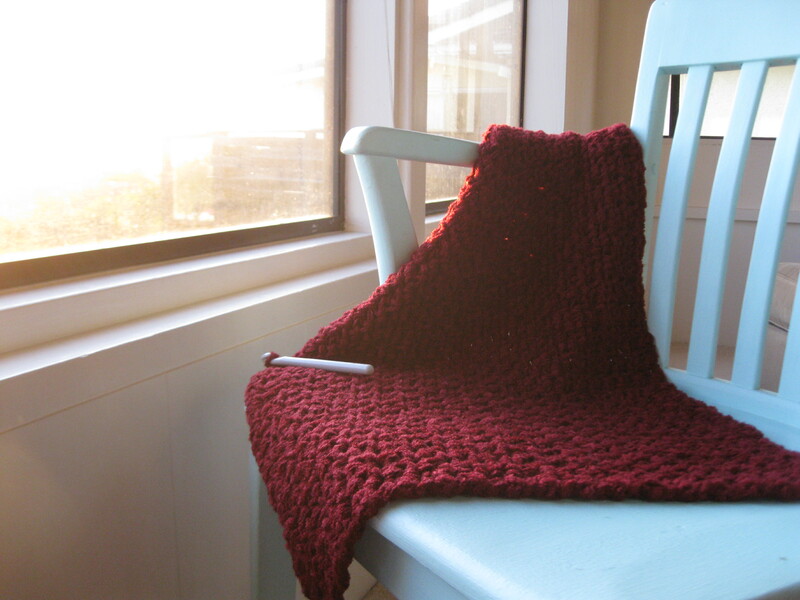 I’ve already started a third afghan, and yes, it is another shell stitch, but who knows. I might decide to rip it out and go with pineapple lace, instead. 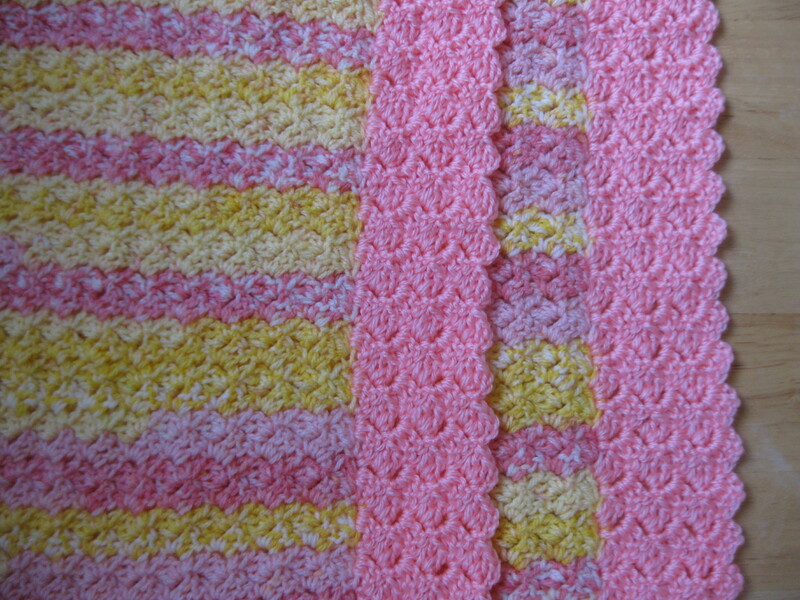 Remember the pink and yellow baby blankie that I was crocheting? 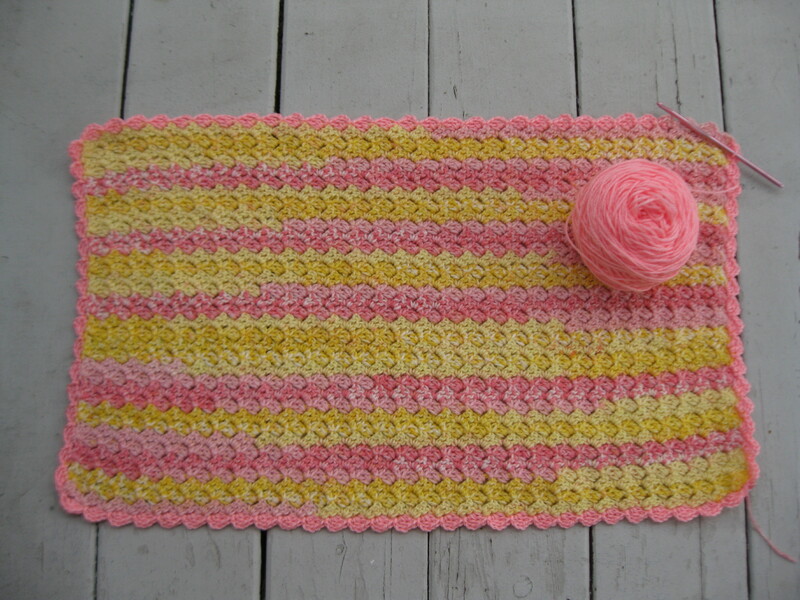 I had run out of the pink and yellow self-striping yarn, so I’d added another yarn in a similar weight and completely different brand. 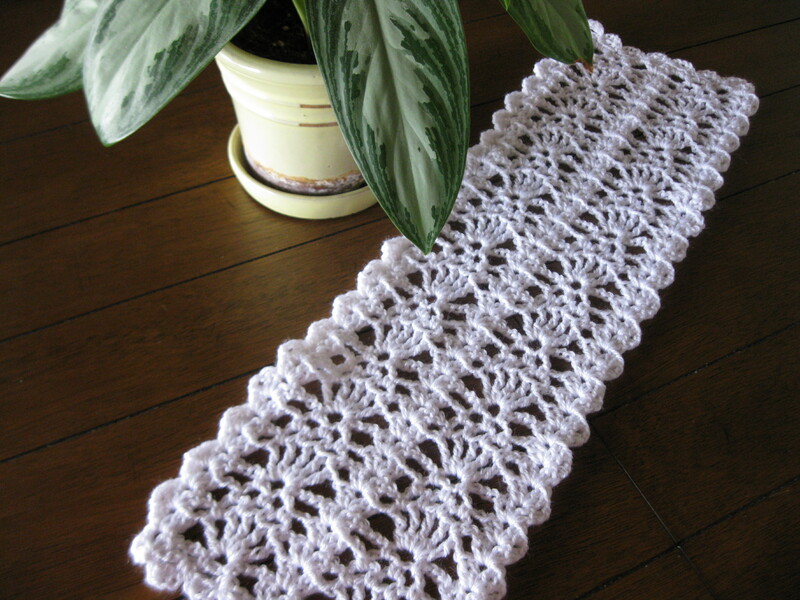 My plan was to crochet a border around the existing rectangle and hope for the best. Yeah, this is going to be a little baby blankie. I kept going and had to fudge a little bit at the corners, adding extra shells to make sure that the edges didn’t bunch up or curl. Those are some improvised corners. I was able to crochet a few rounds before I ran out of yarn. 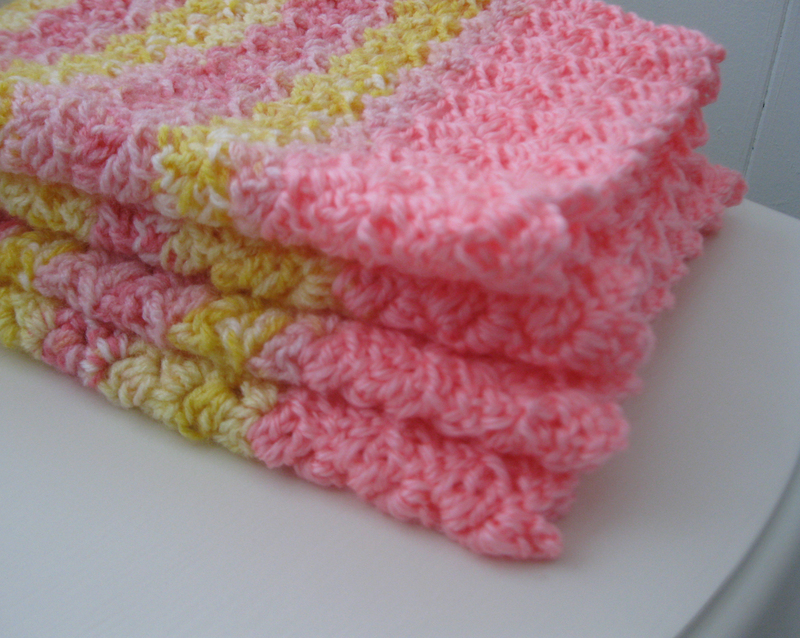 Approximately 2.25″ wide of pink shell edging. Not bad for a small ball of scrap yarn. 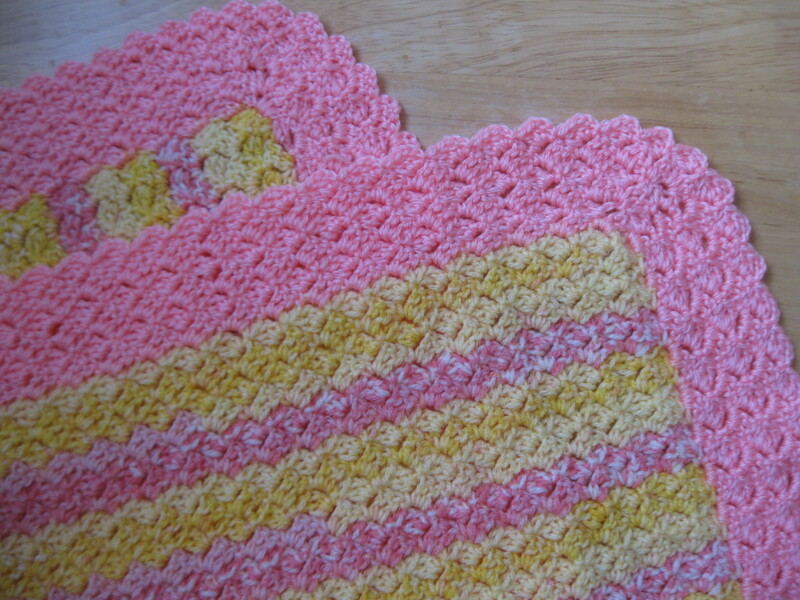 I used the same shell stitch pattern for the edging as I did for the body of the afghan. I’m pretty happy with the way the shells naturally made a scalloped edging. The completed piece isn’t very large (17.5″ by 27″), but it was very satisfying to use up yarn from the stash and transform it into something neat and pretty. It actually turned out to be a cute mini-afghan. I could imagine a little girl using it as a baby doll blankie.